Raku On The Board: Publishing Advice #29: Do you need a business partner? 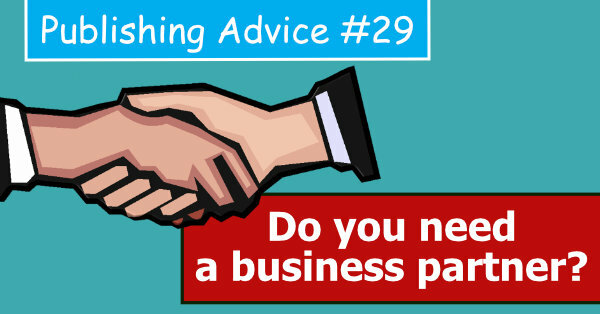 Publishing Advice #29: Do you need a business partner? Do you need a business partner? It's a very tricky question. All depends on your personality, preferences and circumstances. I can't really advice you, and the decision is solely up to you. I'm not writing today about pros and cons of having a business partner, neither trying to convince you to take on a partner or not. If you'd like to dig dipper, I recommend an excellent article by Jamey (Stonemaier Games) Kickstarter Lesson #45: Partnership. It's as I believe a good introduction to my article. In this post, I'll just share my story, what happened recently in my life and how this is changing things around. It's going to be a very personal story. Maybe you will find it relevant to your situation. I'd love to see people being inspired to look from a distance on their lives and business and make the best decision possible. I was self-confident that I could handle things on my own, at least most of them. I didn't consider a business partner very much; although, I was aware of benefits this kind of cooperation could bring. However, recently I asked my brother Jan to join me on this wonderful journey as my business partner. As a result, we are pushing all the board game stuff much more, and everything is starting to roll. That's a massive relief for me! So how everything looked like? Well, just imagine: having a big family, trying to find time to spend with your kids, help at home, a full-time chef job and then me trying to push board game things on my own. It looks quite scary, but I thought I could make it! But finally, I realised that it was too much for one person. I tried to build a good plan, set up some patterns and good working habits. But because of my job, it was impossible. Split shifts from time to time, morning shifts, then evening shifts. Different days off one week and then other days off week after. I like to be organised and stick to a plan - to the pattern I set up. My work made it impossible - that didn't work for me at all. Because of that, my efficiency wasn't as good as I would expect. I was getting a bit anxious about it. - Constant noises generated by my amazing kids. They like to play very loud, argue with each other and believe me or not sometimes they cry. - Always there will be something to help in our lovely household. My wife is pretty good at not distracting me while I'm working; however, it happens from time to time. Because I was spending a lot of time working, my wife would get a bit angry with me. It was a tough time, and I can't blame her; however, this didn't help at all. This is the main issue really, which is hugely related to previous points. Jamey from Stonemaier Games works about 80 hours per week. He's very dedicated to giving his life to run Stonemaier Games. And that's how much effort you must put to be successful - I'm fully aware of this. I know that in my circumstances it's impossible. There is no way I can find 80 hours per week to push board games with a full-time job and busy household. I felt very lonely in all of this. There was no one to say: "Matt, you're doing very well" or "how's your next article, when are you going to publish it?" or "let's do this or that". I'm sure that not everyone needs this, but I'm a type of person who loves to work with others. I recognised that I bore this yoke on my own and that was too much. I felt very lonely in all of that. I realised I'm starting to feel worse and worse. I lost the joy of life, and my vital energy level was low like never before. Constantly tired and almost ready to give up. I recognised that I was sitting in the red zone way too long. (I wrote an article about green and red zones - go and read it to see what I'm, trying to say). Generally, if a person sits in the red zone too long she can have a break down - I'm sure you know that's nothing funny. I was so close to this stage, and I thought I have to do something about it, or everything is going to end up quite horribly. Thank God, I realised my horrible state and understood I have to do something about it. Now everything looks like a brilliant plan, and it did work very well for me. However, at the time I was very stressed, and I didn't find these things very easy and obvious. My first move was giving myself a break - fastest and very efficient way to move out from the red zone and to look for more constructive solutions. I limited my board games to the minimum - to leisure activities like running a board game group or playing board games with my family. That was the first thing I thought about after I left the red zone. I needed help. So I contacted my brother, offered him to join me and luckily he said yes! It's not only an extra pair of hands! He's a very clever person, and he already has great ideas. We are brainstorming quite often, and I found that so precious. He is my supportive soul and shares hours of work. Keeping my family happy will be much easier from now on. Most of the problems are sorted out already. Maybe new challenges connected with having a partner will arise with time, but I'm sure we can handle them! Next step was finding a new job, so I did it straight away after my brother joined me. So my hours are sorted out. Job from Monday to Friday same hours every day. There are still some uncertain things, however, it's a way to go! That's next step I will have to do. It's only a plan at the moment. Once I'll have an opportunity, I'll do it! Please note that each step was followed by another one. Probably without first step the other steps wouldn't happen. Actually, I could see the second step after completing the first one. So why I chose Jan? He's my brother, and I trust him. It's crucial to me to work with someone I can rely on. To sleep well knowing that my business partner is trustworthy. I remember when we played football together, we were communicating without words. I exactly knew where Jan is standing on the playing field and I could feel what he would like to do or is planning. Of course in a good way. He looks at things differently. So we can discuss various strategies, confront them and chose the most efficient one. We minimise the future risks regarding our board game business plan. This is one of his strongest attributes. His great attitude has a significant impact not only on our future business but affects me as well. It motivates me to work harder. Is he perfect? My bro? ;P Of course, he's not. But who is? Most important I know what to expect from him. I won't go for details. The point is that I know where things can go wrong, how to prevent it and if something goes wrong, how to deal with it. It's obvious to me to not expect from my business partner to be perfect. I'm not expecting that from anyone because myself I'm far from being ideal. Thank God, everything ended up being okay now. From now on it's gonna be a new better season for me. A greater one than any time in the past, even before I started to struggle. Anyway, It was very stressful time, and I thought it's necessary for me to share my story, hoping some of you can be encouraged, avoid my mistakes or deal with a similar situation straight away without suffering for such a long time. I know these things are very personal. But maybe you'd like to share your story if you went through similar hardships?